When : Friday june 13 ’till Sunday june 15. What : A weekend full of Scooterfun. 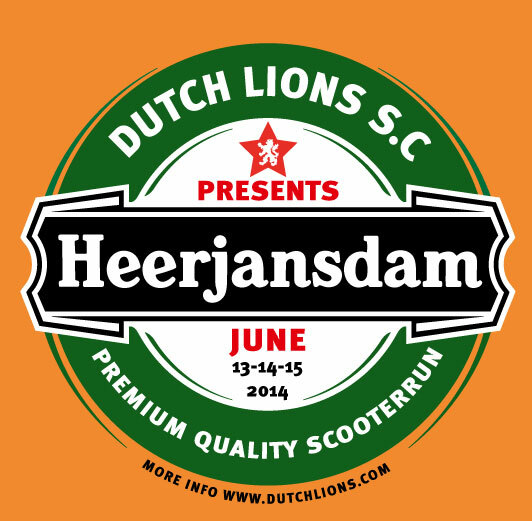 Deejays, Customshow, Trophies, Fungames, WorldCup football on a big screen and a Ride-out. How much? : 20 euros for the whole weekend. Scooterclubs that would like to contribute in the form of trophies for the custom show and the fungames can leave a message on this website. You’ll be mentioned on the flyer and in the booklet. Do we need to buy tickets in advance ? No tickets are needed in advance. You are most welcome! I will be travelling Stena Line form Harwich to the Hook of Holland…are there any special discounts arranged for the Ferry ? Unfortunately not. I don’t know if Stena does discounts at all? I’ve never heard of it. There is a parking next to the gate so that’s no problem. For 20 euro’s you’ll get two nights with deejays. Fungames, ride-out. Free schnapps on the saturday afternoon and a rally patch. Is there camping available on site or is there any campsites local? Hi, do you accept camper vans on the campsite or can you recommend a campsite please, thanks, paul. Just outside the gates at the parking there is place for campers. Hi we are coming over on the Thursday for the rally. Will we be able to get on to the campsite then, we will be in a van? Also do you have directions from Ijmuiden. Thursday you will be most welcome. Vans will be situated just outside the gates. You can put your tent up the pitch then no worries. Directions from IJmuiden. Once on the highway follow Rotterdam on the A4. At The Hague continue onto the A13 towards Rotterdam. At Rotterdam follow Breda (first A20 and then A16) and take exit 23 towards Heerjansdam. Hi, Have you guys set a date yet for a 2015 rally yet? still widely performed by players of cool samba instruments. with 47 top 40 hits.